Despite the promise of big data, most analytics projects suffer from bad data syndrome, the result of tension between CIOs and line of business managers. Having inaccurate or incomplete data is bad for business. Yet substandard data quality is a staple of many organizations, largely because of a disconnect between CIOs and line of business managers, according to a 451 Research survey of 200 senior IT and business leaders from large enterprises. The research bolsters the case for a chief data officer (CDO), a C-suite executive who can both serve as a liaison between CIOs and business managers and boost data quality. Only 40 percent of C-level executives are "very confident" in the quality of their organization's data, says Carl Lehmann, the 451 Research analyst who wrote the report, commissioned by Blazent, a company that provides what it describes as data intelligence platforms. That 40 percent figure is a concerning sign at a time when 94 percent of senior IT leaders say that poor data quality impinges business outcomes, resulting, for example, in lost revenue or bad strategic decision-making. “A big chunk of respondents thought that a considerable amount of value is lost, which doesn’t justify a laissez-faire attitude,” Lehmann says. "You'd expect the respondents to say ‘we need to really get on top of this game’ instead of 'I'll deal with the data I've got and make do." 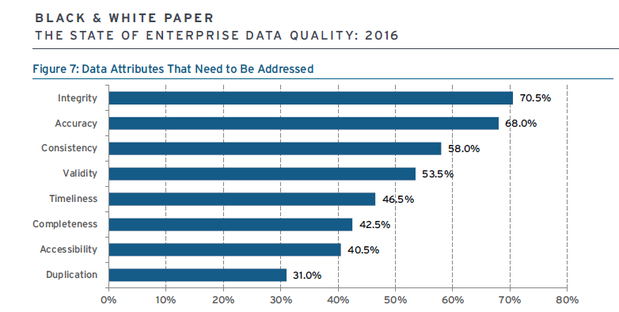 CIOs know that bad data is bad for business, but they aren't putting enough time or resources behind their data quality efforts. That’s dangerous at a time when businesses are seeking competitive advantages with their data. Corporations such as TD Ameritrade, Navistar and Merck Animal Health are on integrating and managing data for business insights, a cornerstone of digital transformations orchestrated by the CEO and the rest of his or her C-suite. The dark secret is that most of the data is poor. Data migrations and integrations often introduce errors, yielding data gaps or duplicate information. Data quality issues are caused by a combination of human errors and technology failures. As a result, Lehmann says that only 50 percent of organizations surveyed say that their data quality management, as well as the quality of data overall, was only slightly better than satisfactory or “good enough in general” – far from a ringing endorsement. And 8.5 percent say they don’t have a data quality management strategy at all. Instead, they “hope for the best,” he says. Corporate data is captured in myriad ways, including manual entry and automatically via an array of computers, mobile devices and software. Next, the data is relayed to larger data warehouses for processing by IT. The CIO’s team processes and cleans the data, weeding out inaccuracies and duplications, a process known as normalization. IT staff typically builds reports or sets up self-service analytics systems for the business lines. Yet, despite this process, data quality problems still arise from poor data entry by employees or customers, data migrations or conversions, changes to source systems, and the introduction of new systems. Part of the problem is the disconnect between the IT leaders responsible for the data and the business line managers who are accountable for the data, says Dan Ortega, vice president of marketing for Blazent, whose software companies such as Visa, Kaiser Permanente and CSC deploy to improve data quality. “There’s no systematic alignment between the line of business needing technology to be more effective for their jobs and the IT people getting ahead of the curve rather than keeping the lights on or reacting to problems,” Ortega says. Blazent CEO Gary Oliver says a CDO could help close the gap between what the business requires and what IT produces, forcing companies to clean up data and procure additional data sources. He says CIOs are often busy “keeping the wheels on” IT systems and don’t have the time to ensure that their teams give the business pristine data. What data attributes most need improvement. Gartner analyst Mario Faria agrees, noting in January researchthat companies are scrambling to drive competitive advantages and improved efficiency through better use of information. "Business leaders are starting to grasp the huge potential of digital business, and demanding a better return on their organizations' information assets and use of analytics," Faria says. "It's a logical step to create an executive position — the CDO — to handle the many opportunities and responsibilities that arise from industrial-scale collection and harnessing of data." Although many banks and other financial services firms employ CDOs, the position is still new, with only 1,000 CDOs in large enterprises, Faria says. However, in an acknowledgment that businesses need an executive to manage enterprise information systems, he says that 90 percent of companies will have a CDO by the end of 2019. “They will have the difficult task of creating an information strategy with relevant metrics that tie the activities of their team to measurable business outcomes,” Faria says.